Ragini took her hand vigorously out of Sanskaar’s hand once they reached the canteen. He was surprised by her reaction. She was kind of fuming with anger because she didn’t want anyone to take advantage of her. The whole scenario didn’t seem good to her. It was like it was bound to happen again. Ragini didn’t give heed to his words. He hoped ragini would understand him. She replied him this time. Ragini was shocked at her own boldness when she was yelling at sanskaar. Actually she had been terrified when karthik was expressing his love, she was literally praying for someone to help her at that moment, but she didn’t want to admit it to sanskaar. He felt really idiotic now. He didn’t know what to say to her to calm down. R: “so u said it all without even thinking?? Woah! Don’t try to take advantage of me okay. and what are doing in this col?” with her eyebrows raised. Sanskaar finally got a little irritated with her attitude. He was actually trying to help her but she was not trying to understand him. R: “haan am the one who is filmy, rgt?” and rolled her eyes. “too much of attitude” muttered under her breath. Sanskaar saw her lips move but couldn’t hear what she was saying. S: “did u say something?” with a hint of doubt in his voice. R: “okay ma paradevadha (tamil word meaning angel from god.. sanskaar uses it here sarcastically). Leave me.” And joined his hands at her. Ragini got confused at his words as she didn’t understand it. Now it was his turn to snub her. S: “actually same here “har baat tumhe batane ki koi zaroot nahi samjhi”. Okay” and quoted it. Both glared at each other. Both shrugged their shoulders and didn’t know what to say to each other and stood turning their backs on each other. Sa: “okay. I will not disturb u again or interfere in your matter until u ask me for” and left his card on the table. Then he turned to leave and remembered one thing. Ragini just nodded her head and sanskaar left the place. After that she took the card and looked at it for a long time. She was thinking abt what had happened. She was totally lost when she thought abt how sanskaar had saved her. It was totally filmy and she was so thankful to him but she didn’t openly accept it. she was partly angry on him for lying that too “the girlfriend lie” was way too much for her. May be he didn’t have any wrong intention but she didn’t want to complicate it by continuing the lie he told for her. Anyway “karthik wouldn’t disturb me anymore I guess” to herself. She got reminded of swara, when she got a call from her. She was kind of angry on her. If she had been there for her, sanskaar wouldn’t have interfered. She attended it. R: “kahan ho tum? ?” with a slight angry tone. S: “di am really sorry. i..i.. was stuck up in the staff room as nilasha mam had called me suddenly.” She lied to ragini. Ragini believed her, but still her anger didn’t recede. S: “does this means, the problem is solved rgt?” was hoping for an affirmation. S: “hmmm I will also tell u once I reach home” and laughed. Actually she didn’t want to tell abt the dance thing. If she knew abt it then she would start nagging her. She wanted to finish this matter without her di’s knowledge. After some thinking she chose to throw it in the bin. She went to her locker where she had kept her bag. She took it and got ready to leave the place. Some girls passed her at that time. G2: “no yaar, I haven’t seen him around here. He seems to be new in the campus. I too wanna see him again.” in a drooling voice. G3: “me too… But there was a girl with him. Does he already have a girlfriend?” with a hint of sadness. G2: “stop it de. It wouldn’t be necessarily his girlfriend. She may be his just a girl-friend”. And all three were giggling. Ragini heard their talk and understood that they were talking abt sanskaar. She rolled her eyes and felt some urge to correct the G-3 when she speculated abt ragini being his girlfriend but controlled herself from over reacting and started walking fast. On her way he bumped into someone in her hastiness. It was laksh. Both said sorry to each other. After he went past her only she realized her part of talking to him abt swara. She had totally forgotten abt it in the whole fiasco. She had to speak to him as soon as possible. Throughout his drive he was just talking to himself, he wanted to clear his mind so drove straight to viki’s place. On his way, he got a call from London. It was from his professor of the university where he completed his MBA. S: “I ll get in touch with u as soon as possible. Thank u.” and cut the call. It was really a happy moment for him. He reached viki’s place in another 5 mins. Viki :” wow what a surprise, ! what are u doing here? That too this early?” and winked at him. V: “ohh have u seen that animal?” tagging along. Sa: “idiot, tumse milne ke liye aaya tha” and caught viki in a stranglehold position from back. They both sat in the balcony. Viki brought him a cup of tea. And he narrated the whole incident. And let out a sigh. After a moment’s silence viki spoke up. V: “ohh really.” With a mocking smile and raised eyebrows. V: “fine. I don’t know what to wish for.” And he sighed. Sa: “offo, meri pyaari girlfriend, don’t worry, I ll be back soon.” And he pinched viki’s cheeks. V: “stop it u donkey.” Viki slapped him hard on his hand. And he laughed after that. Swara was still feeling damn awkward. She had run out of the class room after the mishap (according to her ;)) and found refuge in the nearby room. She could still feel her heart beating fast. She didn’t know what to do now. If she dint succeed in deleting tat video, then she would have to dance in the event. She felt like she was trapped in a lift. Over that, now she felt awkward to face laksh. After a lapse of moment, she realized that she had left her sister alone at the ground. She felt that she would slap herself. She ran to the ground, and found it empty. She called her sister. She cut the call. She was curious to know what would have happened. For now, she dismissed that thought as she knew her sis was safe at this moment and thought abt the meeting she had with nilasha mam. She went to the dance room and found Sanjana and rahul there. 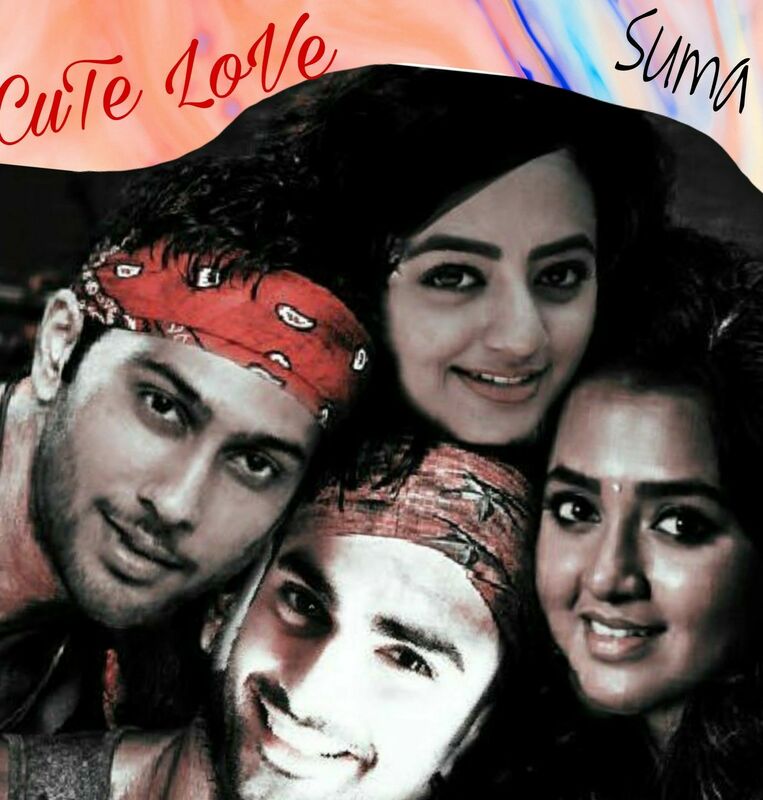 Sj: “swara, btw where is laksh? was he with u?” expectantly. She was actually waiting till now only to go with laksh and felt happy when swara said she would come alone. S: “ohh I don’t know. I dint see him at all.” She was seriously hoping that nobody would have seen them falling over each other. Sj : “ohh..” and her face fell. It was getting late. At that moment, nilasha mam came. Swara was not comfortable with this idea. She dint want to meet laksh or to speak with him. she strongly objected to the idea of travelling along with him. Swara had to say only yes and nothing other than that. But she was fidgeting inside. Sanjana didn’t want to leave but she had to because it was getting late. Laksh was in a dazed state when he left the classroom. This was the first time he felt something electrifying and his heartbeat increasing in a crazy manner. There had been only one other instance when his heart skips a beat, that was when he scored a goal. He didn’t wanted to think more abt it because the more he thought abt it, it just made him crazy. He received a msg. he took his mob to see from whom it was. It was from rahul. Just then he noticed something shining on his shirt in the reflection on his mob screen. He noticed that it was a broken chain entwined in his shirt button. He took it out carefully. It had a heart dollar and it was a chain made of silver. For a moment he was confused of how suddenly it had got on his shirt, cauz he definitely knew it wasn’t there before. he then guessed that it must be swara’s and got reminded of how she fell on him again and again and in the end kissed him. It made sense now. He kept it in his pocket and made a mental note to give it to her without fail. And he just bumped into someone as he was still dazed. He said sorry and went forward as he was getting late for the meeting. When he went ahead, he heard someone calling out his name. but he had never seen her before. When she said, she was swara’s sis, he didn’t know how to react. He felt that swara would have complained abt him to her and her sis had come to meet him to tell him not to bother her sis. L: “ohh, actually I didn’t actually mean to do all those things…u know… she was the one who started it.” he was struggling for words. He wanted to justify his acts before she could start scolding him. Laksh was surprised when she said it. he was expecting something but was hearing something. Laksh’s face got stern when he was reminded of it. dance. There is some other reason why she won’t dance on a stage.” And when she said that tearsformed in her eyes and she became emotional. Laksh was bewildered when he heard that. So there was something else and not him. he was oddly pleased and at the same time confused. R: “am sorry, I can’t tell u abt that. Because it is her personal and it would be better if she would tell u, if she wants to.” And she smiled. L : “okay but how is it possible for me to help u in this?” he was still confused abt this. Laksh was not still convinced as he didn’t want to behave like a jerk to swara anymore. R: “Just think that you are actually helping someone to come out of something. pls” in a pleading tone. When he heard that sentence of “Just think that you are actually helping someone to come out of something.” he couldn’t say no to it. Laksh nodded his head and gave her a smile. At that time his mobile rang. It was swara. He signaled to ragini that it was her sister who was calling him, and attended the call. And she left the place. His mind started thinking abt swara again. He had misunderstood her. His perception changed a lot abt her. He always thought of her as of someone with too much attitude, but now he was genuinely interested in knowing what the real reason would be. Now he wanted to make her dance like any other dance mate would help out. He was in a different josh now. He made his way to the dance room. He found swara standing outside the room. When he saw her, all his josh disappeared and awkwardness rose. When he went near her, he cleared his throat to gain her attention. Swara turned to see laksh. She wanted to sound diplomatic as she was also feeling awkward. Laksh nodded his head in affirmation. S: “don’t feel triumphed that I am going to dance, I ll delete the video asap and walk of this program.” And she tossed her hair around. Laksh felt different when she tried to provoke him now, but still he got provoked when she did that. L : “shall we?” and motioned his hands forward. Swara walked first and when they reached the bike stand laksh asked her to stop. S: “I don’t want to.” And she folded her hands. Swara pouted in frustration and hit her forehead with her palm before she got on his bike. Laksh was feeling amused. It was always a treat for him to watch her getting irritated because of him. She looked cute when she pouted in frustration. She had to hold him for support when she got on the bike and swiftly removed it once she got on. Laksh revered his engine as if he was getting ready for a race. He speeded up after they he rode out of the col campus. Swara was holding the side extensions to steady herself so that she didn’t have to hold laksh for support and she sat with a distance from him. As he was speeding up it was getting difficult for her. Twice she dashed against him, when he braked. L : “sorry, I am intending to go a little fast that this. Because we are already getting late and we have to reach the place in another 10 mins. U don’t know abt the dance instructor, she is very strict with punctuality. I have worked with her before.” And he speeded up even more without waiting for her reply. He could see that she was feeling frightened with the speed through the side mirror. L: “don’t worry swara, u ll be safe” and laughed at her. L : “just hold me tight for support and u ll not feel scared. Just hold me.” and speeded. Swara didn’t want to, but in the speed he was going, it made her feel scary as she always made her papa go at only 50. She never allowed him to exceed that that. For her 100kmph was too much. As the rear seat was little elevated, she had no choice. She hesitated for a moment but after she felt that she no longer could put up a brave face, She decided to hold him, She was scared to death by speed and held him tight by hugging him from back. And she closed her eyes. When she held him like that, he felt something electrifying. His heart started beating like crazy. The post Zindagi na milegi dobara- SwaLak & RagSan ff (Chap 6) appeared first on Telly Updates.